Szilárd 'BSzili' Biró has compiled the arcade puzzler Tail Tale for AmigaOS 4, AROS and MorphOS. Tail Tale is a free Doujin puzzle game. Szilárd 'BSzili' Biró has ported MultiRacer to AmigaOS 4, MorphOS and AROS/x86. This car racing can be played in splitscreen mode with up to four players. In the single player mode you have to race against a "ghost car". AEROS is now available for the amiqube at Amiqube or in the indieGO!-Appstore. amiqube is the CuBox-i (Wikipedia), which is an ARM-based, small-sized computer. The processor is an i.MX6 Dual Lite. According to their own statements, the amiqube is distributed on the market by Amidore Inc. and also is available in three stores in Florida, USA. This is an Italian company belonging to Formato Media SRL based in Rome. A new version of LiveUpdater for Icaros Desktop 2.0 is available for download. People who will download and install Icaros Desktop 2.0.1 from scratch will find it already installed into the distribution, but people willing to update their current installation of Icaros 2.0 to the incoming update 2.0.1 should download and install this little program (20KB), which will improve update operations quality and efficiency. 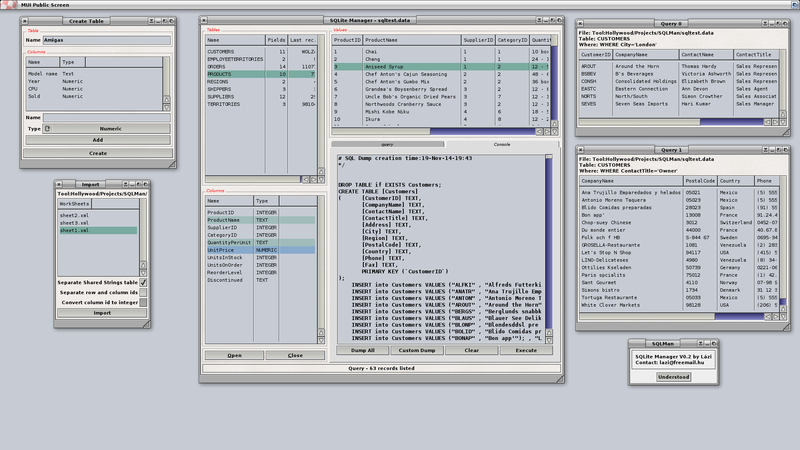 Lázár Zoltán has released a second alpha version of his SQLite Manager (screenshot). Using this Hollywood-programm it is possible to create, open and edit databases. It is also possible to convert Open-XML spreadsheet files. The programm is available for all Amiga systems (AROS only for x86). "Main new feature is the ability to create queries by the SQL Select command or by interactively select corresponding items. The queries can transfer to new separate windows in any quantity." An update for PortablE has been released which is a fix for the latest Software Development Kit (SDK) of AmigaOS 4.1. Most likely AmiDevCpp will not compile programms for AmigaOS 4 until this compiler is also adapated to the new SDK. Christopher Handley's meta compiler PortablE is an enhancement for the programming language Amiga E and translate it into other ones with "the aim of being portable across many platforms." Codename this time is "Anti Anti"
Public release follows as usual some days later (missing the feature of executing Linux apps from AROS). 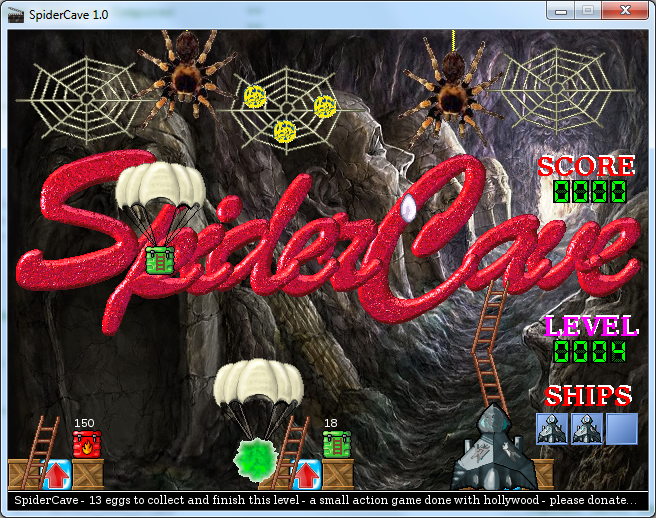 Achim Kern's "SpiderCave" is a simple arcade game in which with your spaceship you have to avoid the attacks of a spider and to build ladders to the spider webs to steal its eggs. This is definitely a treat for Halloween! It took 18 months of work. Very hard work. But the new major release of your favourite AROS distribution is finally available for download! Icaros Desktop 2.0 is completely different from previous releases. The same care that was used to turn AROS nightly builds into a pre-configured desktop environment has been applied to DirectoryOpus 5 too, whose default configuration has been completely overhauled to turn it into a reliable, usable and enjoyable replacement for Wanderer. Read more at the link below..
Alpha Aminet release for AmigaOS3, OS4, MorphOS, AROS. This application based on the SQLite database engine and lets you create, view and modify databases. The database handling can happen via the GUI or there is an SQL command shell to serve any needs. There is a preliminary support for open xml spreadsheet files which can be converted to databases and even to native Amiga spreadsheets.